The day I dropped Henry off for a week of “camp” with Trainer, I almost felt a little bad. 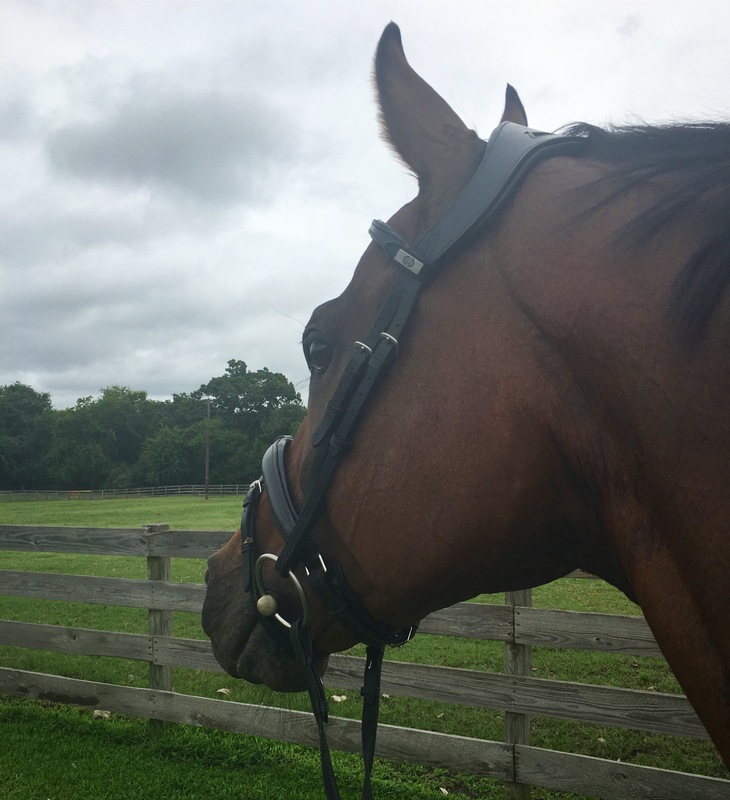 He hadn’t been ridden much in the few days beforehand, a cold front had just blown through, and he had already been a bit full of himself lately without those factors. I mean… I did warn Trainer that he might be a little frisky, so ya know, all’s fair? There was at least 1.25% feeling of guilt hidden somewhere deep down inside, but it didn’t stop me from cackling maniacally as I pulled out of the driveway. Y’all already heard about the first update on day 1: “I didn’t die today, but… it was touch and go for a few minutes.”. Sounds about right. I think he must have realized his situation, because the next day he came in missing a shoe and a bell boot. Jokes on him, the ground out there is so soft and sandy that missing a shoe was not enough to get him out of a dressage ride. He got to do counter canter and simple changes and Trainer sat the trot and worked on the transitions. Basically a true Henry torture session. Things continued to stay challenging and serious. Obviously he’s very stressed out being away from home. He got his shoe put back on (ripping off another bell boot in the mean time, for good measure) then had a jump school on Saturday. So very grateful for people taking pictures for me (thanks Amy!) since I couldn’t be there. Trainer reported that he was a bit lazy and careless at first but as the jumps got bigger and he got better about jumping from the base, things improved. He has square poles and placing poles in his future. I was originally planning on bringing him home on Sunday, but since we got so much rain I elected to leave him there for a few more days. At least there he can still get turned out and ridden… it’s going to take us a little longer to dry out here. But I did need to get up there and a) bring him more food, b) try out The Unicorn before the trial period was over, so I drove out on Sunday for a quick dressage lesson (in between rain storms) instead. Summary – he’s trained me very well to tiptoe around his tension. Time for him to learn how to work through pressure instead of catering to him and taking the pressure off the moment he gets tense. It’ll take a while to retrain that instinct in me. He was pretty good though, and The Unicorn was PERFECT! YAY! No more saddle shopping. then he’s got a jump school today and another dressage ride tomorrow before I go pick him up, followed by a jump lesson on Thursday before Trainer heads out to AECs (side note, I was feeling ever so slightly sad that I qualified at N but couldn’t go, until I saw the courses. Now I’m fine not going.). 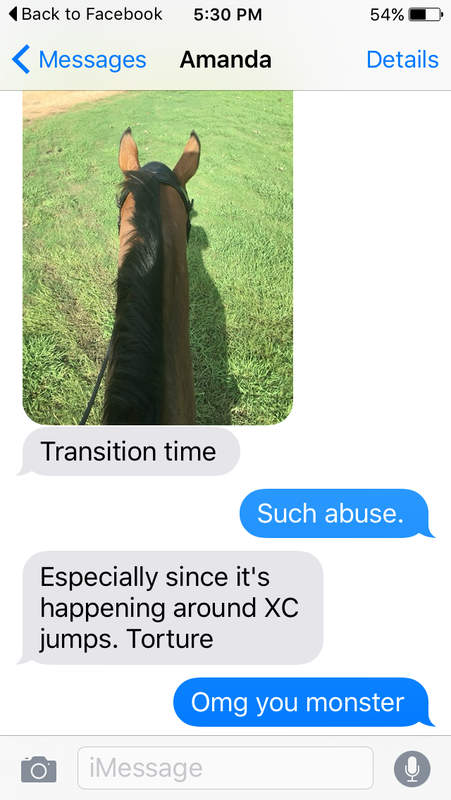 I think Henry is pretty pissed that he’s currently living at a facility with an XC course and he hasn’t gotten to school XC at all, but that’s what he gets for being so good on XC. Poor Henny. Hah, I love Henny’s Camp Adventures! Me too, it’s been fun to watch! I miss him though, ready for him to come home. I’m guessing Henry has the SPCA on speed dial, with all those XC jumps and him being forced to do dressage. Poor Henry. Yay for no more saddle shopping! And those pictures, haha. The jumping ones are sweet though!! He approves of the jumping part. Seriously busted out laughing when I saw the Henny sleep picture. He seems to spend his nights playing so hard that a mid morning totally sacked out nap is required. I do not. Obviously. Hence Henry’s current transition abilities. ugh poor tortured henny! sounds like camp is working out well for everyone else tho haha. also – curious, what about the AECs course do you dislike? The design and layout. Not my favorite. Especially not for a really expensive show that is a 17 hour haul away. I’d rather enter 3 shows closer to me (or Coconino!) that had more of what I’ve come to expect from a cross country course, instead of spending 75% of the course spiraling around a polo field and derby field. I’m not really interested in a Wellington Showcase version of eventing. Your trainer sounds awesome. Looks Henry had some fun in between the torture sessions at camp too. Congrats on the Unicorn working out!!! She is awesome! I just wish I was closer to her. ha i read that closer to the Unicorn not the trainer (THO they are one and the same at times??) LOL! Well, one I would like to sit on, the other, not so much. so glad the unicorn fits and is awesome!!! Its interesting that you do not like the xc course set up for AEC. The facility is just down the road from where I board and while I am not an eventer I have been paying close attention to the facility. It is an interesting place mostly due to the fact that it perpetually looks like it is half finished yet they keep hosting big money shows there. I am dressage scribing on Friday for the AECs and would have totally fan girled you and Henry had you made the trip. They will have to do a lot of work on the XC for me to ever want to make that drive! Bacon can’t believe the torture you are putting him through. I mean, having to jump from the base? Might as well feed him to that snake at that other barn. It would be equal. at least he got to jump? The passed out Henny photo is priceless. Just found your blog and spent, I don’t know, like a week? reading it from the beginning. Have spent approximately $500 at Aztec Diamond, Divoza, Riding Warehouse, Relatively Stable, Emily Equine Creations, and have purchase a pair of RJ Classics Gulf breeches. Okay, maybe more like $1,000? Do jumpers but have watched more XC helmet cam video in the last week than in the previous for-ever. So yeah – I guess I like your blog. You’re one of the best enablers I’ve ever known and I love you for it. As does the pile of 8 ear bonnets sitting in the front seat of my car. Can’t wait for the continuing Adventures of Henry. Oh yeah – that’s a compliment!! I love stuff! I’m practically ready to start eventing so I can get more if it! Seems like a totally valid reason. She is a monster! Cruel and unusual punishment to make him school around but not other the jumps. The Henny napping picture cracked me up. Does he lay down flat out like that often? If so, I think he needs an instagram #SirHennyNapsALot. I had a really hard time reading the words because I was distracted by your tack. Haha man poor Henry… Someone save him! !